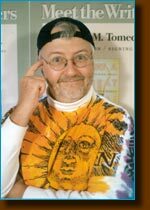 If you're looking to round-out a science event or want a unique fundraising opportunity for your school or organization, then a book signing by Steve The Dirtmeister® Tomecek may be just the thing you're looking for. Through a special arrangement with Steve's publishers, we can provide your organization with bulk copies of all of his books at a discounted price. You can then either pass the discount on to your members or you can sell the books at full price and use the difference to raise money for your organization. Either way, there is no minimum number of books to buy. Steve will be happy to combine a book signing with a Science Assembly, Family Science Program or Author Visit and to make matters even easier, he can bring all the books with him. Books can be pre-ordered or purchased on the day of the event. To find out more about book signings by the Dirtmeister®, including the current list of book titles and discounted prices, simply call our offices at 800-296-2022 or e-mail us at info@dirtmeister.com. Copyright 2003-2014 Science Plus, Inc.